I use double cream as once whipped it seems to be able to take more liquids such as the rose water and raspberry liqueur. You can swap the raspberries and Chambord for strawberries and strawberry liqueur if you prefer, I've also made this in winter using tinned mangoes and the mango syrup from the can and it was absolutely divine. In a large bowl combine your double cream, Chambord, icing sugar and food colouring and whisk until you have medium-firm peaks. Spoon half of your cream mix onto one of the meringue bases and scatter some raspberries over. 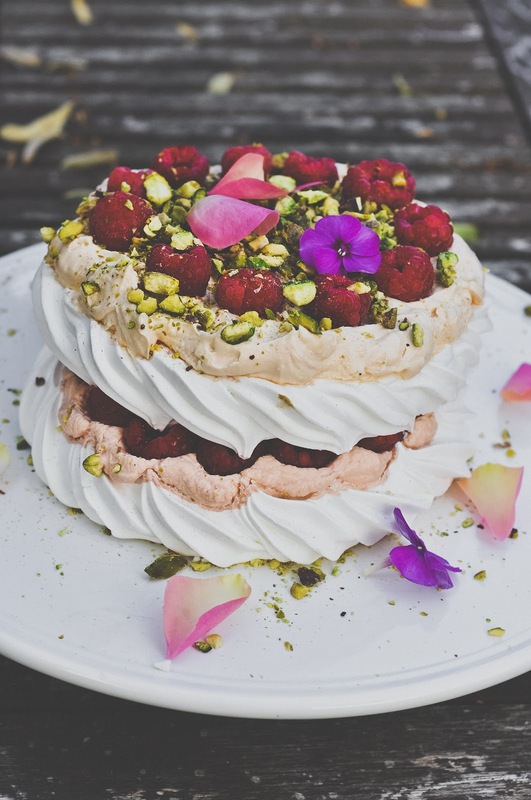 Turn the second meringue base upside down so the flat base faces up and place on top of the raspberries. Cover with the rest of the cream and raspberries and scatter over your pistachios and flower petals. This looks so pretty!!! Will have to try iy. Where do you get your petals from???? I grow lots of edible flowers in pots in my tiny garden but the rose petals were actually from my local florist (50p). You just need to make sure that they have not been sprayed with any nasties then just pick a single stem in whatever colour takes you fancy. Try and buy British grown flowers too if you can. Wild roses grow everywhere though so I often pick a few and freeze/dry them for another day (also rather nice steeped in gin to make a lovely drink a few weeks later! ).